14 Nov 2018 –The United States has appropriated and is obligated to spend an estimated $5.9 trillion on the war on terror through Fiscal Year 2019, including direct war and war-related spending and obligations for future spending on post-9/11 war veterans. Table 1 summarizes the direct war costs – the OCO budget – and war-related costs through FY2019. 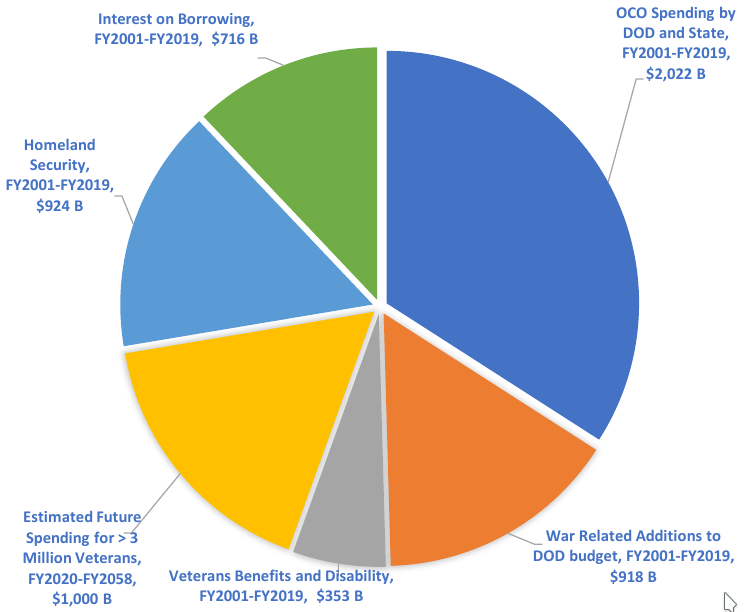 These include war-related increases in overall military spending, care for veterans, Homeland Security spending, and interest payments on borrowing for the wars. Including the other areas of war-related spending, the estimate for total US war-related spending allocated through FY2019 is $4.9 trillion. But because the US is contractually and morally obligated to pay for the care of the post-9/11 veterans through their lifetimes, it is prudent to include the costs of care for existing post-9/11 veterans through the next several decades. This means that the US has spent or is obligated to spend $5.9 trillion in current dollars through FY2019. Table 1 represents this bottom-line breakdown for spent and obligated costs. Neta C. Crawford is Professor and Chair of the Department of Political Science at Boston University and Co-Director of the Costs of War Project at Brown University. Anticopyright: Editorials and articles originated on TMS may be freely reprinted, disseminated, translated and used as background material, provided an acknowledgement and link to the source, TMS: Costs of Post-9/11 U.S. Wars to 2019: $5.9 Trillion, is included. Thank you.